The bold engraved Jupiter keyring is now available in 4 different shapes: rectangular, square, round and oval. The overall feel and quality of these metal keyrings, however, has not changed, they're still as strong and well engraved as ever. These keyrings can be engraved on both the front and back, and with a highly polished silver surface, your logos are sure to shine. A bold contemporary keyring now offered in 4 different shapes - Rectangular, Square, Round and Oval. Heavyweight solid feel with 5mm depth, highly polished shiny silver plain finish to both sides. 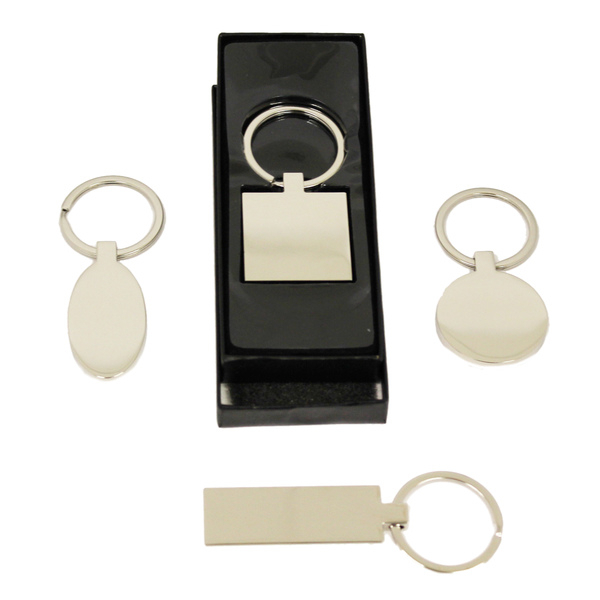 Nickel plated 1 piece keyring for extra strength and security with split ring attachment. Presented as standard in a lidded gift box with inner moulded tray. Overall dimensions of rectangular version as shown 63 x 20mm. Engraving area 40 x 15mm. Ideal for laser engraving front and back.